One of the easiest, healthiest and most versatile recipes that you can make is Instant Pot Chicken Bone Broth. Whether you are a new Instant Pot owner, or have been using one for years, you will notice that a significant amount of recipes will call for chicken broth as the main liquid ingredient. Chicken broth provides an additional layer of flavor to recipes. It is even recommended to use it instead of water when making something as basic as rice. But it can get expensive if you are buying several cartons a week at the grocery store. Not to mention, you have to be cautious about the sodium content in certain varieties. That is exactly why I began making my own chicken broth years ago. I first started to make it by using my Crockpot Slow Cooker. I would put in a chicken carcass that I had left over from making a whole roasted chicken. 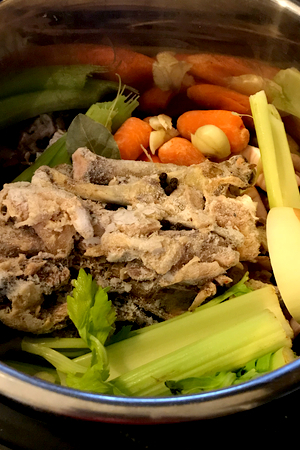 Frozen chicken carcass surrounded by veggies is the basis of chicken bone broth. I threw in some vegetables, herbs and seasonings and let it slow cook overnight. In the morning all I had to do was strain it and let it cool. I would have 6 quarts of broth that I could use for recipes throughout the week. But it wasn’t until I got my 6 quart Instant Pot that I considered making true Instant Pot Chicken Bone Broth. 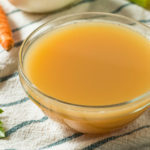 Before we get in the specifics of Instant Pot Chicken Bone Broth, we first must explain the difference between the terms of stock, broth and bone broth. 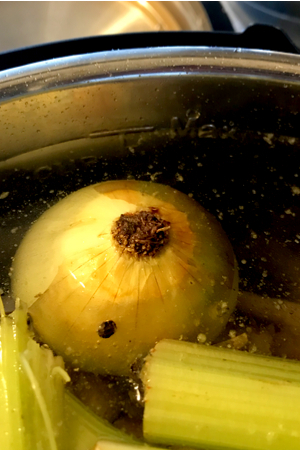 Your scrap veggies are perfect to use to make bone broth. Although these terms are often used interchangeably, they are not the same product. Chicken Stock is made by simmering meat, vegetables, seasonings and sometimes bones for a short period of time. It is lighter in color and has a slight chicken flavor. Chicken Broth is simmered with bones, vegetables and seasonings for longer periods of time. The longer simmering time produces a stronger chicken flavor and a deeper colored liquid. Chicken Bone Broth is made by simmering bones and sometimes vegetables and seasonings for hours upon hours. The bones cook down so much that the collagen is infused into the liquid and produces a liquid that turns to gelatin state when cooled. So why make chicken bone broth instead of basic chicken stock or broth? 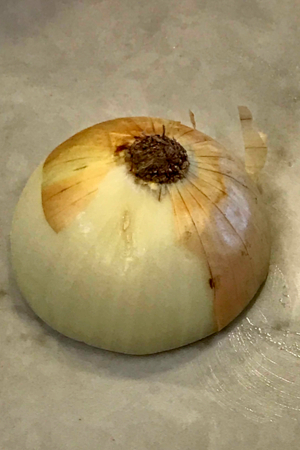 No need to take off the ends or skin of the onion. The health benefits of bone broth is all the rage right now! Just check out any health website and you will be sure to hear the term bone broth. Bone broth has gut-healing gelatin and huge anti-inflammatory nutrients that many people could benefit from. Not to mention, the collagen content helps a variety of skin conditions. 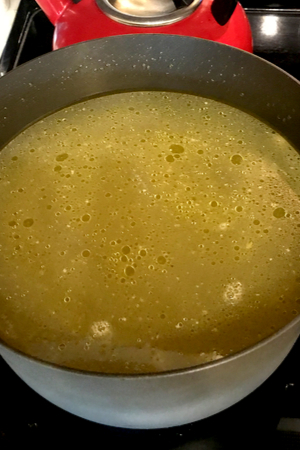 When heated, the gelatin turns back into the liquid form and it can be used in place of any recipe that calls for chicken stock or broth. So instead of making stock, we now make Instant Pot Chicken Bone Broth every week! It is surprisingly easy to make bone broth. However, there are a few tips to make it even easier. Pour enough water to fill the instant pot just below the MAX line. Every time that you make a whole chicken, save the chicken carcass. We make Instant Pot Whole Chicken every Sunday. We use the meat throughout the week and throw the bones in a plastic bag in the freezer. And whenever we have vegetable scraps, we do the same. 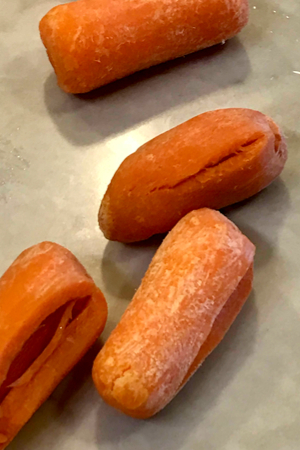 We put those baby carrots that are starting to turn white into a bag along with the ends of the celery stalks and onions. Whenever I am ready to make Instant Pot Chicken Bone Broth, I simply pull them both out of the freezer and into the pot. I add in a few aromatics such as garlic and herbs and fill the pot with water. We also add in a little apple cider vinegar which helps penetrate and break down the bones. This helps to release the collagen into the broth. After 2 hours of cooking your bone broth is ready to be strained. It takes 2 hours to cook and all that is left is to strain it and let it cool. 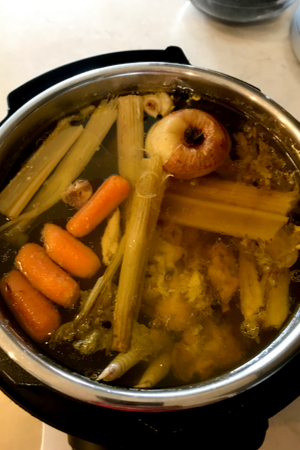 There is one more thing that we add to make the BEST Instant Pot Chicken Bone Broth. Chicken paws….Yes, chicken paws. And yes, they are actually chicken feet. I know this sounds disgusting to the common person, but it really makes a huge difference in the amount of collagen that is infused in your bone broth. I can remember my Grandmother telling me how she used the entire chicken to make broth when she was growing up. The bone broth is straining and you can see the chicken paws on top. If you think about it, there is very little meat in chicken paws. They are full of bones and tendons which release a ton of collagen when broken down in the pressure cooking process. So I always try to add a package of chicken paws along with the whole chicken carcass. My local grocery store actually carries packages of chicken paws. If you can’t find them, ask your butcher to order them. But don’t worry if you can’t find them or if you can’t fathom the thought of using them. You can still make healthy and delicious Instant Pot Bone Broth without them. 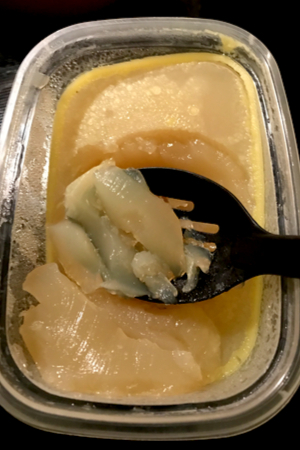 Once you cool your cooked bone broth, it should become gelatinous. If it isn’t as gelatinous as you would like, simply cook the next batch longer. I have found that if I simply use a single chicken carcass that I may have to increase the cook time to 190 minutes for the collagen to break down completely. I have also saved the cooked chicken carcass from the previous batch of bone broth and added it in with the new set of bones to make a second batch. 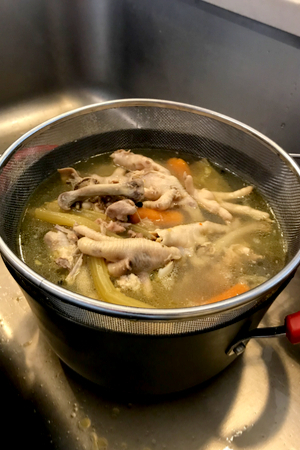 Healthy chicken bone broth made in a fraction of the time that it takes on the stove or in a slow cooker. Place the bones and chicken paws (optional) in the liner of the Instant Pot. Add in the celery, carrots, onion, garlic, apple cider vinegar, thyme, Italian seasoning, peppercorns, salt and bay leaves. Fill the Instant Pot with water just below the MAX fill line. Close the lid and place the knob in the sealing position. Pressure Cook/Manual on HIGH pressure for 120 minutes. Cook time will begin after approximately 30 minutes for the pot to come to pressure. Once the cook time is up, allow the pot to Natural Pressure Release. This will take approximately 30 minutes. Strain the broth through a fine mesh strainer and allow it to completely cool. Remove the layer of fat from the top and place in covered containers in the refrigerator or freezer. The broth will become gelatinous when it cools. This recipe was tested in both the 6 quart and 8 quart Instant Pots.